Mail Order Bride and Special Delivery Mailman! This homemade costume for couples entered our 2012 Halloween Costume Contest. 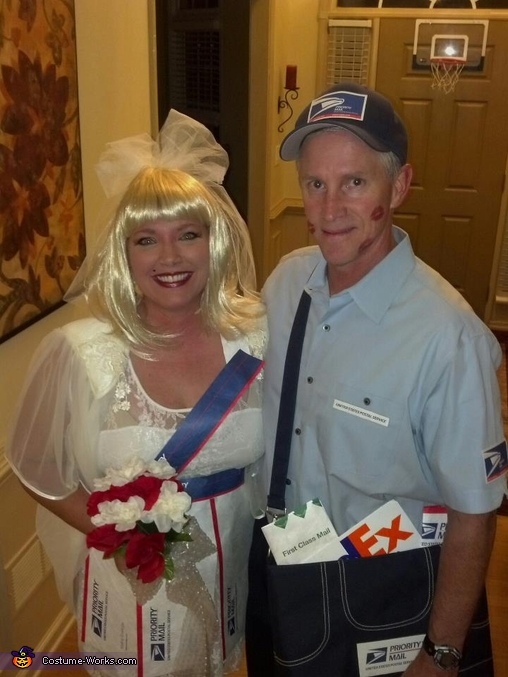 Mail Order Bride and Special Delivery Mailman! The Bride is Laura Thompson and my costume is made with envelopes, clear packing tape, and comes complete with a bubble wrap train and bow on the back of the dress! My skirt is mailing envelopes! Bubble wrap also adorns my bouguet. My husband is the Mailman and is ready to deliver with a bag full of letters! His costume was made with shipping supplies cut and turned into his name tag, mailbag decor, etc. His mailbag is actually a diaper bag! The Mailman decided to keep me as his own Special Delivery :) We had a lot of fun making and wearing these costumes this year!